Jewelry display riser is versatile, able to be used as both as a riser & container! Nesting style of pedestals allow them to be stored inside each other or stacked! This jewelry display riser is a multi-purpose display, able to be used as both pedestals to elevate items and as containers to hold products and keep them in place. 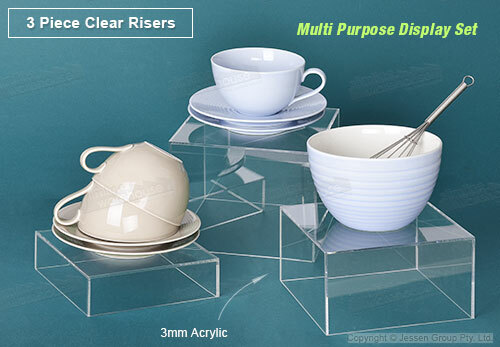 The acrylic store fixtures include (3) different sizes with the set, perfect for holding different products and highlighting them in unique configurations that will best capture the attention of passersby. This style of acrylic fixture is popular in many areas, including jewellry stores, make-up counters, retail stores, and restaurants, bakeries or cafes. The plastic stands set, jewelry display riser is made from 3mm thick clear acrylic. This helps to provide a stylish display that fits in well with any décor whilst offering a durable stand that will last for years to come. These retail store stands are designed to be stacked on top of one another or nest within each other depending on what configuration you wish to go with. Order today to create a memorable merchandising area!